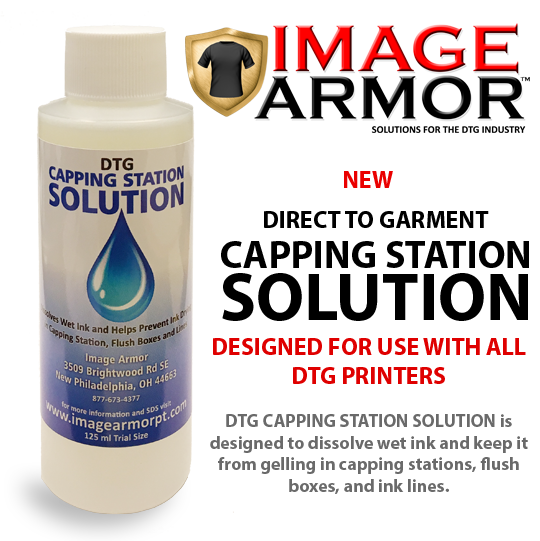 Image Armor is excited to announce the release of our new DTG Capping Station Solution. This new solution is designed to dissolve wet ink and keep it from gelling. This keeps capping stations, flush boxes and ink lines open and cleaner. 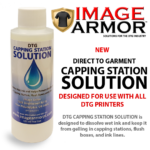 The Capping Station Solution dissolves wet DTG ink making which in turn helps your printer function at optimal performance. This new formulation will be available in late October. Subscribe to the Image Armor Notification List to keep up to date about all the new happenings with our pretreatments and inks. Click here now! © 2019 Image Armor LLC.